According to Wikipedia, "cacciatore" means "hunter" in Italian. Whether or not this is true, here's a hunt-free and cruelty-free recipe. This came out really well! 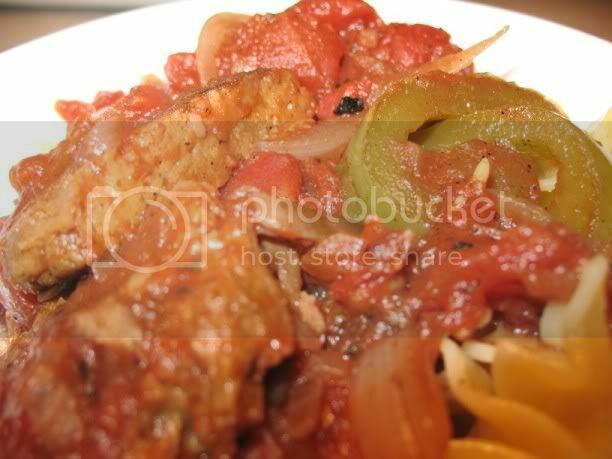 Soft, warm tomatoes with tender vegetables and "meaty" sietan. I suggest at least starting this off in a skillet. It gives the dish a smoky taste and you get all the flavour from the seitan and vegetables. My skillet isn't big enough (I found out halfway through) so I transferred it to a large stockpot. I can't post her recipe w/o permission but she has a book coming out, so use regular seitan, homemade or storebought. You could substitute Morningstar Chik'n strips or another chik'n substitute. Marinated tofu or tempeh could probably be used. • Protein- cut or tear it into large chunks. • In a large skillet, heat 1 Tbsp. of the olive oil over medium heat. Add the faux chicken, sauté until brown, move to a plate lined with paper towels, and set aside. • In the same skillet, heat the remaining 1 Tbsp. of olive oil over medium heat. Add the garlic, green pepper, and onion and sauté for 2 minutes. Add the mushrooms and continue cooking until the vegetables are soft. Add the chopped tomatoes and red wine and simmer, covered, for 30 minutes. • Remove the lid, add the faux chicken and roasted garlic, and continue cooking for 10 to 15 minutes or until the liquid is reduced and the sauce is slightly thickened. • Meanwhile, cook the noodles according to the directions on the package. Drain. 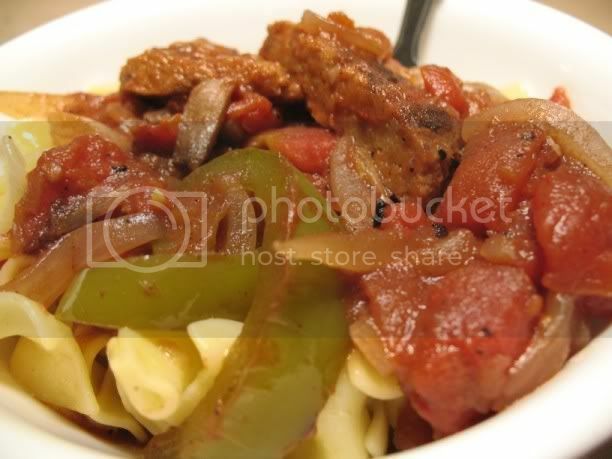 • Serve the cacciatore over the hot noodles.